Chennai has a lot of avenue sprawling evenly across its limits, to bequeath you with that much-needed relief from the heat and humidity, that persists the city. The Semmozhi Poonga is a gorgeous botanical garden with a name literally translating to “Classical Language Park”. 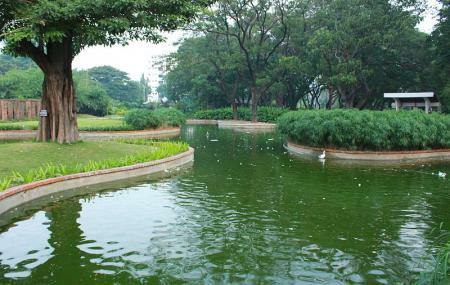 It is run and manged by the horticulture department of the Government of Tamil Nadu. What you must look forward to on your visit here is the large number of exotic flora and rare plant species, medicinal and aromatic herbs. Given ticket prices are for adults. INR 15 for Two-Wheeler Parking. INR 75 for Big Vehicles Parking. INR 25 for Camera photography. INR 50 for Handy cam / Video Camera. INR 2000 for Professional Photography. INR 10,000 for TV Serial & Short Film. INR 20,000 for Film Shooting. How popular is Semmozhi Poonga? People normally also visit Vgp Universal Kingdom while planning their trip to Semmozhi Poonga. Nice garden....With different types of flowers and many trees and artificial ponds. Not very well maintained but can manage to get a good photo or two. Small entrance fee but the place was full of couples, which didn't give a good vibe. It's located in the middle of the city between Cathedral Road-Anna Salai, so easily accessible by road. It has a large parking area & decent canteen. In between the concrete jungle, the lush green environment is feast to eyes. it's a botanical garden and one can find a variety of exotic plants & trees. The kids would surely love the place. It's beautiful landscape is preferred for couple photo shoots & by photographers. It's best place for family to spend a couple of hrs for a cool & calm summer evening.